Cinnamon Swirl Quick Bread could be called Cinnamon VERY Quick Bread! A simple, from scratch quick bread topped with a cinnamon streusel swirl. I love this bread. It could be called Cinnamon VERY QUICK Bread because it is so easy to make. I love the cinnamon swirl and the buttermilk keeps it moist. Basically, I love everything about it. Except for the fact that my mom, who passed this recipe on to me, only makes it once a year for Thanksgiving or Christmas. I have taken over the recipe and I make it year-round. I made myself a loaf earlier this week (so I could take some updated pictures) and have eaten nearly the entire thing. By myself. Apparently the baby likes it just as much as I do. Serve this bread at breakfast with Ham & Potato Breakfast Casserole or after a dinner of Meatloaf with Brown Gravy as a dessert! 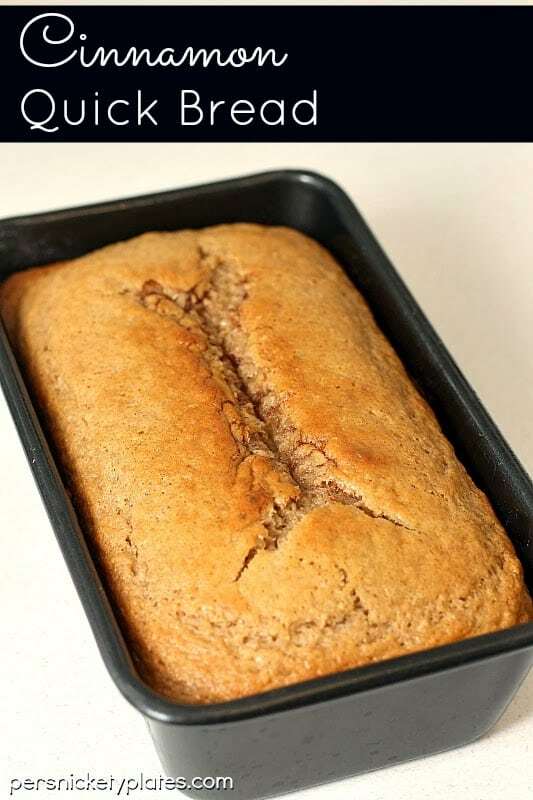 A quick bread is a bread that uses leavening agents (baking soda, baking powder, etc.) instead of yeast to make the bread rise. Cinnamon – since cinnamon is the star of the show in this bread, pick a good quality cinnamon like ceylon cinnamon that isn’t full of fillers. Buttermilk – see notes below for a buttermilk substitute if you don’t have any on hand. Vanilla Extract – please use a real vanilla extract. I know it’s a bit pricey, but it’s worth it. I grab it at Sam’s or Costco because it’s cheaper to buy in bulk. Throwing this bread together is SO easy. First, to a large mixing bowl add the flour, sugar, baking powder, cinnamon, salt, buttermilk, vegetable oil, vanilla extract, and eggs. Beat with a hand mixer for 3 minutes, until fully combined. Next, in a small bowl, make the streusel by adding sugar, cinnamon, and room temperature butter and roughly combining it with a fork. Then, pour the bread batter into a greased 9 x 5 loaf pan and then sprinkle the streusel mixture over the top. Gently swirl with a knife. Finally, bake for 45-55 minutes or until the center is set and a toothpick inserted into the center comes out clean. Insert a toothpick into the center of the quick bread to see if it’s done. If the toothpick comes back clean or with a moist crumb on it, it’s done. It should also have a cracked top and slightly pull away from the sides of the pan. Sometimes your bread will fall in the center which can be disappointing. There are a few reasons why this might have happened – it might not have been fully done baking, you didn’t use enough leavening agents, or you let the batter sit too long before baking it. If you really want to make cinnamon bread but realized you don’t have buttermilk, I have a hack for you! Add one tablespoon lemon juice or white vinegar to a liquid measuring cup, and add enough milk until it measures 1 cup. Stir, and let sit for five minutes before using. Voila. Replacement buttermilk. Mixing Bowls – I always talk about how I love these with the grippy bottoms, but I really do. Hand Mixer – As much as I love my stand mixer, I end up using my hand mixer more. Silicone Spatulas – I have far too many of these, but I use them for EVERYTHING. Loaf Pans – I like a simple glass loaf pan. I also have some dark non-stick ones and silicone one. Any will work. Cinnamon Quick Bread could be called cinnamon VERY QUICK bread. It doesn't get much easier than this! Spray a 9 x 5 baking pan with non-stick spray and set aside. In a large bowl, combine all "Bread" ingredients and beat 3 minutes on medium with an electric mixer. Pour into prepared baking dish. In a small bowl, combine all "Streusel" ingredients (make sure you start with room temperature butter!). I use a fork to bring it together. Sprinkle the streusel over batter & swirl. Bake 45-55 minutes or until the center is set and a toothpick inserted in the center comes out clean. It’s in the oven now. I healthful it up a little but using half while grain wheat flour, and applesauce in place of the oil. I picked up a lovely Saigon Cinnamon at the bulk food store. This combined with your slow cost cinnamon almonds are making my house smell amazing. !